The best kept secret in dogs- Japanese Chin! Rome Kennels is a very small group of select dogs who are primarily pets, one or two of whom may be seen in a show ring from time to time. 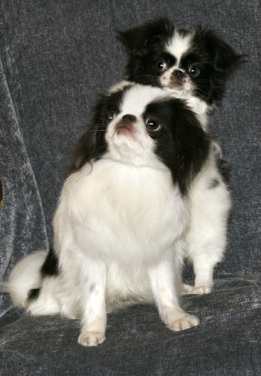 We will not have any Japanese Chin puppies this year or in the future at this point. Please contact me for referral to other Washington state breeders. Member of: American Whippet Club, Cascade Whippet Club, Japanese Chin Club of America, Japanese Chin Club of Ireland. All pictures and photographs on this site are copyright the photographer and may not be used or duplicated in any manner.